Conor joined Hiking Hounds in 2017, Conor brought to the pack much experience as a responsible and avid trail user. He is certified in Leave No Trace, and as a Wilderness First Responder. Because of his passion for trail running, he piloted our afternoon running program, and the high cardio dogs love it! Conor has a great sense of our dog's dispositions and aptly treats each dog according to their individual needs. Conor has a great sense of order on and off the trail, he maintains excellent trail etiquette and obedience within the pack. Occasionally you will see Conor's assistant, Emmet on Instagram - at three years old, this little guy is all enthusiasm for the fours leggeds - Emmet is learning strong leadership skill at an early age! Hiking with the pack since March 2019, Kelly brings great energy and humor to her groups! Kelly has had a lifelong love affair with dogs and the outdoors. An Arizona native, she worked her way through college in North Carolina as a veterinary technician where she was affectionately nicknamed "the dog whisperer" and where she relished the opportunity to learn about, work with and come to respect not only all breeds of dogs but dozens of other animal species as well. After graduating from East Carolina University in 2007 where she studied psychology and neuroscience, Kelly began her career at the University of Utah in the bio-engineering department doing research and development on a neural prosthetic chip for a government funded bionic arm project, and a few years later moved to the University hospital's Moran Eye Center to study the biochemistry and biophysics of age related macular degeneration and other inherited ocular diseases. After a very fulfilling 12 years at the University of Utah, Kelly is excited to make a career change that will enable her to spend more time with her husband of 15 years, their 6 year old son and their autism therapy dog - a 5 year old 80 lb labradoodle named Sawyer. In addition to her love of hiking and dogs, Kelly is an avid skier, world traveler, musician, computer nerd and an adventurous spirit with an insatiable appetite for learning and trying anything new. 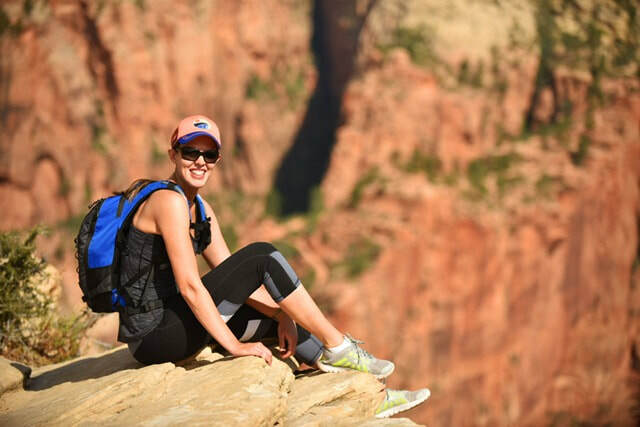 One of Kelly's life motto's is; "experiences are always better than things" and she is so excited to meet and have new experiences with the Hiking Hounds pack and have a great time doing it! Jack Has been a member of the Hiking Hounds team since May of 2017, Jack is currently at the University of Utah studying to be a Labor & Delivery Nurse. Jack is an avid hiker, runner, climber, surfer and dog owner. Recently he relocated from spending a few years in Hawaii. He is happy to return to Salt Lake City and plans to do seven peaks this year. A perfect day for Jack is spend exploring the Wasatch Front with his best friend, an Aussie Mix named Kolohe. Jack feels his current studies in the nursing filed give him a greater sensitivity towards all beings. He understands dogs, life on the trail and good health practices. He is thrilled to be a part of the Hiking Hounds pack and to get to know each of your four-legged friends. He looks forward to keeping your dogs safe on trail while having loads of fun! ​Olivia has been working with Hiking Hiking since February 2016. She has quickly adapted and taken charge. Her understanding of animal behavior has been instrumental! Olivia has an intense passion for everything outdoors and alive. She studied environmental science and has had many opportunities to work with wildlife. A highlight of her work experience includes training marine mammals at the National Aquarium and The Aquarium of the Pacific. She has thoroughly enjoyed getting to know each dog at Hiking Hounds and looks forward to spending more time with them outside! Hiking with the pack since August 2014, Nick likes to vary his hikes - he will either cruise up a trail close by, but if his day allows he prefers exploring trails from Park City to the West Desert. I knew that working with dogs, and in the outdoors could be a good fit. I can truly say working with the Hiking Hounds pack has changed my life. I love being on trail, I love working with the dogs, I love reactions from other hikers when our dogs are at their best. I'm happy to know all of you and, of course, your fur babies. We all treat them as if they were our own, and when we don't see them for a while we miss them!